Here at US Air Purifiers, we’ve written extensively about the negative effects that air pollution can have on people who are exposed to it on a regular basis. Recently, we were made aware that the area in and around Long Beach, California, suffers from very high levels of air pollution that may be harming residents there. 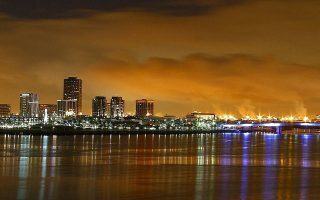 Here’s what you need to know about the low air quality in Long Beach and what air purifiers are best for people living in the area. How Bad is the Air Quality in Long Beach? According to a recent report by the California Environmental Protection Agency, several of the ZIP codes in and around Long Beach fall in the top five percent of areas with most health risks as a result of pollution. ZIP codes 90813, 90810 and 90815 have particularly high pollution levels. While other parts of Long Beach aren’t quite as bad, poor air quality is fairly ubiquitous throughout the city. The state’s report found parallels between the level of pollution in several Long Beach ZIP codes and their incidence of both low birth weight and asthma. Major pollutants that contribute to the low air quality in Long Beach and the surrounding areas include particulate matter from diesel engines, ozone and pesticides. Each pollutant introduces its own health risks and adds to the air quality problems faced by the area. What Air Purifiers Do We Recommend? If you live in Long Beach or any other area that is heavily affected by pollution, it’s important to protect yourself. If you have questions about our air purifiers or how they can help keep you and your family healthy, please feel free to contact us, and we’ll provide you with answers and personalized product recommendations for your needs.